If you are looking for clubs, stories, breeders, or anything else related to the ultimate riding horse, the Peruvian Paso Horse, you have come to the right place. I know how to say "Peruvian" But, how should I pronounce "Paso?" What does the Peruvian National Anthem sound like? Welcome to Pasos on the Web! HELP: Peruvian Horse - Lost AND Found! Refresh your web browser, so you don't miss anything. Thank You to all who have made constructive comments, suggested fixes, clarification, and even new sections. You know who you are! Your help is always appreciated! If you do not see your site linked, and you are a Peruvian Paso owner, Paso breeder, or Paso tack dealer...PLEASE let the WebMom know. If you ARE linked, a link to Pasos On The Web! on your links page would be appreciated. If you discover a LINK that is incorrect or dead...PLEASE let the WebMom know. If you have a photo of your Paso, that you took OR you have permission to reproduce, send it as a jpg to the WebMom with the registered name of the horse and the names of individuals appearing in the photo. You may see it added to the website! The WebMom of "Pasos on the Web!" web site has made every effort to assure accuracy of the information placed on these pages. "Pasos on the Web!" assumes no responsibility for any errors or misrepresentations contained in ads, articles and results of shows found in these pages. Ads are written by owners/representatives of horses and businesses, "Pasos on the Web!" cannot guarantee accuracy of this information. Articles are placed here for your enjoyment and benefit. Reference to any entity or product does not constitute endorsement by "Pasos on the Web!". Readers of this web site are solely responsible to make independent inquiry and evaluation of suitability of horses, services, products or any other information found in these pages. None (Piece/Part/Picture/Article) of this Web Site may be Reproduced in Any Manner WITHOUT Written Permission of the WebMom!! "Pasos on the Web! " All Rights Reserved. Yes, ALL! Using the pull down menu on the left, you can access articles from Peruvian judges, links to breeders, jewelry, art and sculpture, poems, funny jokes and much, much more. If you would like to submit an article for publication, you are welcome to do so. There is no compensation of any kind, but there are bragging rights. Pasos On The Web! is an online resource for the Peruvian Paso Horse, and one of the first places folks go to for information about the breed. There are Peruvian Training Centers if you would like a professionally trained gaited horse. Although the gait is not taught, basic commands and respect are taught. Peruvian Pasos are wonderful family horses. Although each horse is an individual, there are many Peruvian Pasos that are babysitters for the trainers toddlers and other young children. A safety helmet is recommended, EVERY RIDE, EVERY TIME, and adult supervision is required. Horses are very large animals. Even the smallest Peruvians are still 800 pounds! That is a lot of animal to control, especially when they encounter the unknown. The Peruvian Paso is one of the smoothest four beat gaited horses in the world. Descended from the horses of the Conquistadors, Peruvian Paso horses possess the royal lineage of the noble Spanish breeds. A fiery spirit and gentle nature in a horse willing to work and just as eager to please. 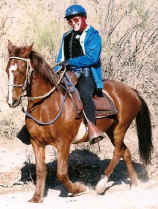 The Peruvian Paso horse is designed for the comfort and enjoyment of the rider. The gait of Peruvian Paso horse accounts for the smooth ride. It is a four beat lateral pattern with the footfalls being : right hind -- right front -- left hind -- left front. The result is one of the smoothest rides of any breed of gaited horse. For riding pleasure, the ultimate trail and pleasure horse is the Peruvian Paso horse. They are known as the Champagne Ride and you really can hold a glass of champagne and ride...without spilling a drop! Peruvian Pasos are extremely sure footed. They can cover lots of territory in a short amount of time. If you plan on riding 20 miles in a day, please condition your horse before you do it. Peruvian Paso horses will go until they collapse. They will give you everything they have, just to please you. Please take that into consideration. If you can hop off the couch, without doing any exercise, and run a marathon, great! And be able to walk the next morning? Same goes with your horse. If you work them frequently, and feed them right, with fresh hay and clean, cool water, they will be happier and be able to go longer, and will be able to get up on the right side of the corral the next morning and do it all again!